There are strong indications that the Minister of Women Affairs and Social Development, Aisha Alhassan, may dump the ruling All Progressives Congress to the United Democratic Party. An aide to Mrs. Alhassan, who pleaded anonymity, said that the former minister resigned her appointment on Friday morning. However, when contacted, the media aide to Alhassan, Mr. Bala Maina, said the resignation remained a speculation and that the former minister would react at the appropriate time. A source close to the minister said her resignation had to do with the decision of the National Working Committee of the APC, which refused to grant her clearance to contest the governorship primary of the party in her home state of Taraba slated for Sunday. Alhassan and the Minister of Communications, Adebayo Shittu, who is from Oyo State, were not cleared to contest for the governorship primary by the National Working Committee of the party. Though no reason was given in the case of Alhassan, Shittu was not cleared following his failure to participate in the mandatory one-year National Youth Service Corps scheme. 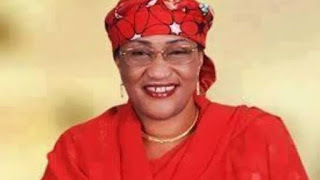 Another source in Jalingo, the capital of Taraba State, siad that Alhassan was not surprised by the decision as she was privy to an alleged plot by the National Chairman of the Party, Mr. Adams Oshiomhole, to frustrate her ambition of becoming the next governor of Taraba State. It was gathered that the open declaration by the former minister in support of the presidential ambition of a former Vice President, Atiku Abubakar, put her in the bad books of the APC leadership. The source said, “The minister is a force to reckon with in Taraba and nobody can win her among those contesting for the party’s gubernatorial ticket in the state.